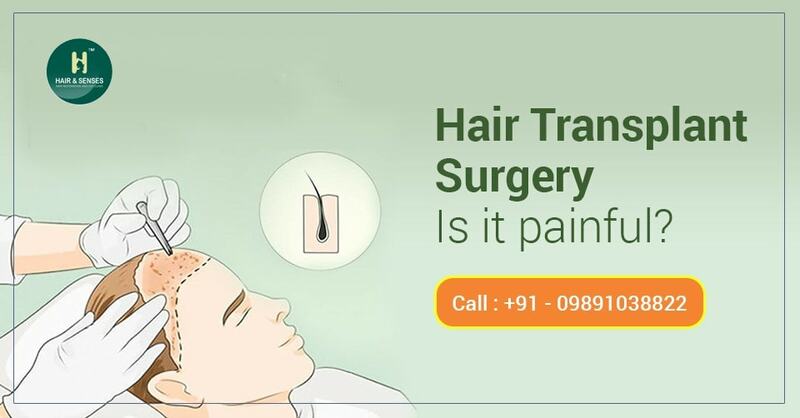 Hair Transplant Surgery: Is it painful? Hair transplant is a surgical procedure and as with any surgical procedure some amount of discomfort is bound to happen. It is the duty of the transplant surgeon to make the procedure as comfortable and pain free as possible. One has to understand that the patients have their own apprehensions and tension regarding the surgery and adequate counselling should be done to make the patient comfortable and calm. Every possible step should be taken to reduce the procedure related anxiety. Use of anaesthetic creams may reduce the prick pain of the local anaesthetic injections. Local anaesthesia should be used in proper dosage and using proper technique so as to make the procedure comfortable for the patient. If patient feel pain any time during the procedure then additional supplement of the anaesthetic agent may be given. In order to make the post operative period comfortable, pain killers and anti-inflammatory medicines are prescribed for initial 3-4 days in case of FUE and may be longer in case of FUT. In terms of pain and procedure related discomfort, FUE is relatively pain free. In cases of FUT patient may experience some feeling of tightness in scalp. At our clinic every single step is carried out meticulously and all protocols are followed to reduce the anxiety and pain and thus make the procedure as painless as possible. Anytime during the post operative period if patient has any query regarding the post operative care and rarely if patient feel any discomfort, our doctor is always ready to listen and provide proper solution to the problem.